This mural is a pretty accurate description of how I feel on days like these. It's too hot, no really, it's too damn hot. I come from Celtic stock and we like our summers wet and windy. At least with the rainy season hitting Seoul tomorrow, there will be a little relief before the real onslaught of summer sun sets in. 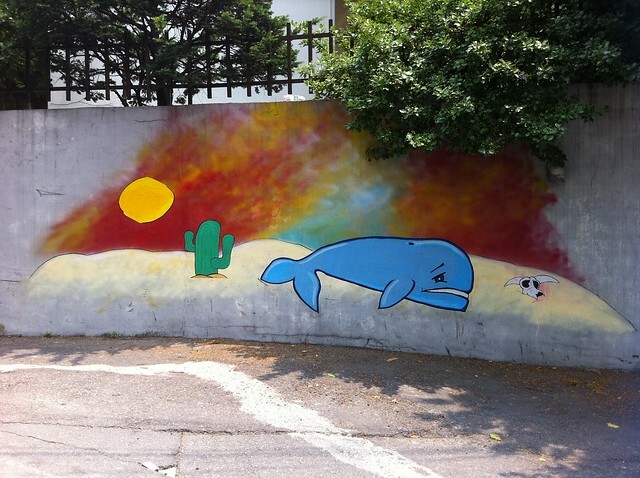 Mural found near Noksapyeong station. No whales were harmed in the making of this post. I'm not looking forward to the endless humidity and the nasty bitey little flying things, but when the monsoon hits I gain a certain sort of pleasure splashing about in the cooling rain.